Tempo® SC Ultra Pest Concentrate is intended for use as a general surface, spot, or crack and crevice spray in and around buildings and structures and their immediate surroundings. Permitted areas of use include, animal runs, animal holding areas, animal quarters, boarding kennels, chicken houses (when birds are not present), dairy barns, feed lots, horse stables, kennels, livestock barns and holding facilities, storage areas, storage rooms, trailers, turkey houses, utility rooms, and rooms in animal facilities. Not for use in and around residential areas. Do not use in commercial food/feed handling establishments, restaurants or other areas where food is commercially prepared, processed or served. Do not use food utensils such as teaspoons or measuring cup for food purposes after use with insecticides. 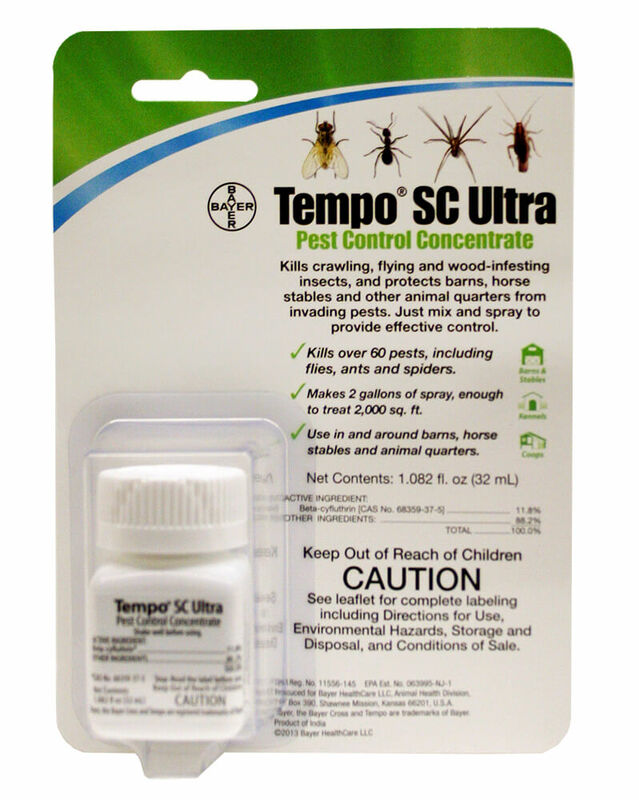 Cleaning of all areas prior to use of Tempo® SC Ultra Pest Control Concentrate will increase levels of control. Any foodstuffs infested with pests should be removed and destroyed.